1937 FORD CONVERTIBLE MODEL 78 21stud flat head v/8 with 3spd on the floor brakes have been up graded to hydraulic\'s, car is 85% 90% restored have the receipt that goes with it if you want. 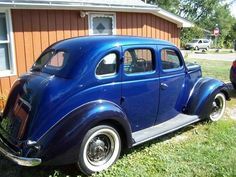 The car drive\'s great all the gauges work to the speedometer is right on the money so is the gas gauge run like a dream it also has a heater 2000 thousand miles since rebuilt. Please Note The Following **Vehicle Location is at our clients home and Not In Cadillac, Michigan. **We do have a showroom with about 25 cars that is by appointment only **Please Call First and talk to one of our reps at 231-468-2809 EXT 1 ** FREE Consignment Visit Our Site Today Easy To List Your Vehicle and Get it Sold in Record Time.